In October, Seattle’s condo market reflected another month of strong sales velocity, constricting inventory and falling condo prices. 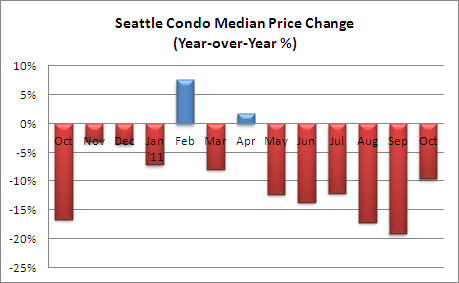 The median Seattle condo sales price in October fell to $226,000, a 9.6% drop from last October and a one-month slide of 5.8%. That’s the lowest point the median has been since March 2004…prior to the construction boom. 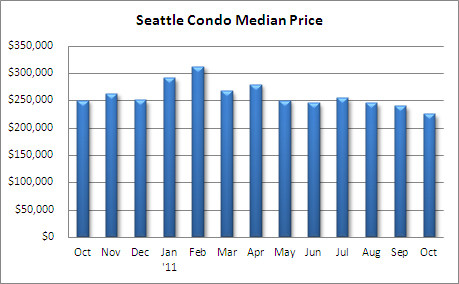 Only West Seattle realized an increase in median price, up 12.8% over last year. Whether that’s good or grim depends on whether you’re a condo owner or a buyer. We tend to think of declining home values as negative, and if you own a condo, it can be financially devastating. Yet, for those seeking homeownership, the current marketplace offers opportunity. Seattle condo sales improved with the number of properties going under contract rising 56.3% over last October to 211 units, and a one-month gain of 4.5% over September. 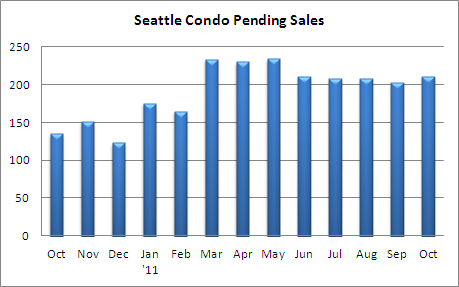 Pending transactions increased citywide with North Seattle (north of the ship canal) and West Seattle more than doubling the number of pendings in October. 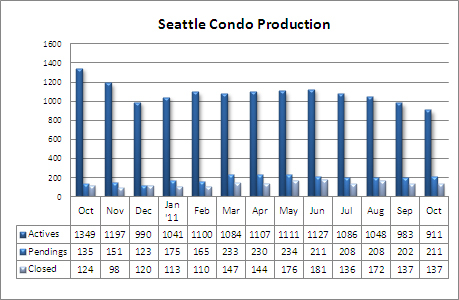 The 137 closed condo transactions reflected a 10.5% increase from last October and were unchanged from September. With the exception of Capitol Hill, the number of closed sales increased citywide. Queen Anne / Magnolia reflected the biggest jump increasing 75% year-over-year. The number of available Seattle condos for sale reduced significantly, down 32.5% to 911 units compared to the same period last year. That’s the fewest since February 2007. Active listings will continue to decline through the end of the year. Seattle’s condominium inventory supply rate – a measure of how long the current inventory will take to sell based on recently sales volume – dropped to an 18-month low of 4.3 months based on pending transactions. The rate based on closed transactions also improved to 6.6 months. 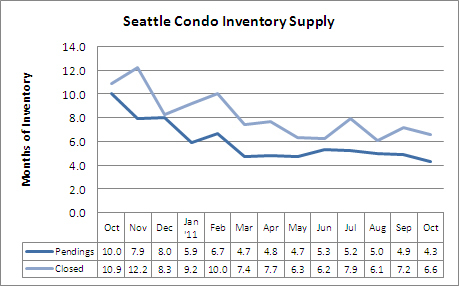 The inventory supply rate suggests Seattle is in a neutral market, neither a buyer’s nor seller’s market. However, that’s not a completely accurate picture as Seattle’s real estate market is dependent on locality and price point. For example, Northwest Seattle and Belltown reflect a seller’s-to-neutral market while West Seattle is a buyer’s market. Properties under $250,000 represented 54% of closed sales last month but only 45% of the available inventory creating scarcity and competition among lower priced condos. 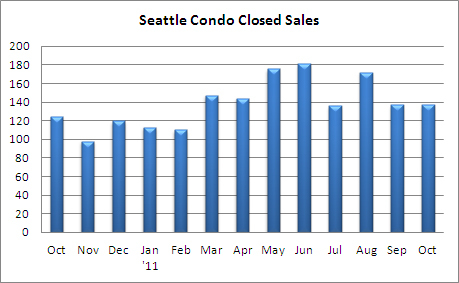 Through October 31, 2011 there were 1,459 closed condo sales in Seattle with a total dollar volume of $513,065,628 and a median sales price of $257,000, per recorded NWMLS sales (does not include foreclosure, auction and private sales). During the same period in 2010 there were 1,563 closed sales with a total dollar volume of $569,856,374 and a median sales price of $286,000. Through the first 10-months the citywide median sales price is off by 10.1% from the same period last year. Source: NWMLS. Some statistics were independently calculated using NWMLS data. If you’ve got the funds, now is a great time to buy. Many good deals to be had with all of the short-sales and bank owned properties.